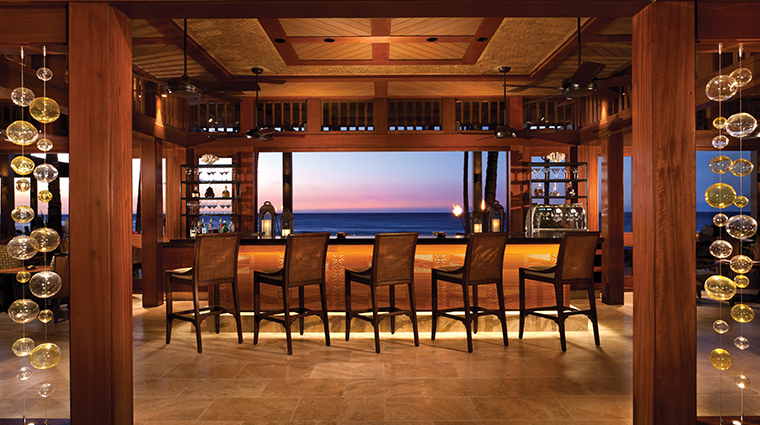 From the moment you enter the open-air lobby and sip the fruity rum punch offered at check-in, you will be in pure Hawaiian heaven at this Forbes Travel Guide Five-Star resort. 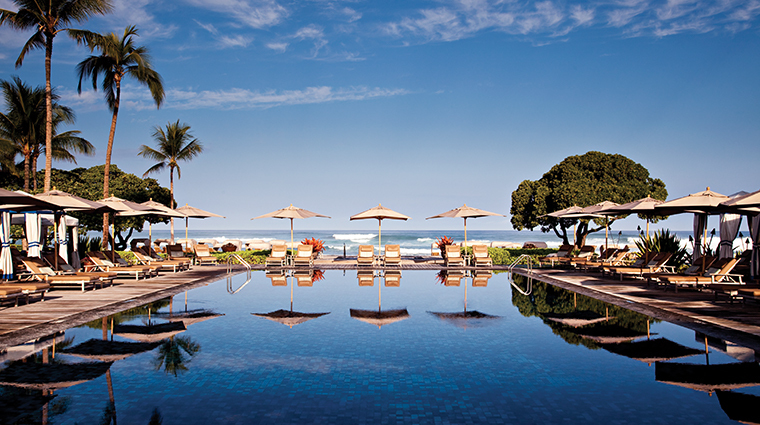 Four Seasons Resort Hualalai is designed to blend into its natural setting, and it does. 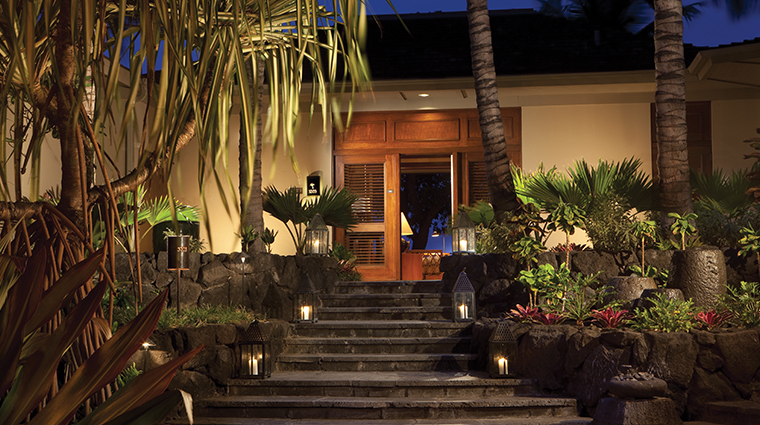 Instead of a hotel tower, you’ll find charming bungalows carved into the black lava rock. Cabanas, which can be enclosed on all sides for total privacy, line the saltwater pool, where the staff dotes on guests all day long. 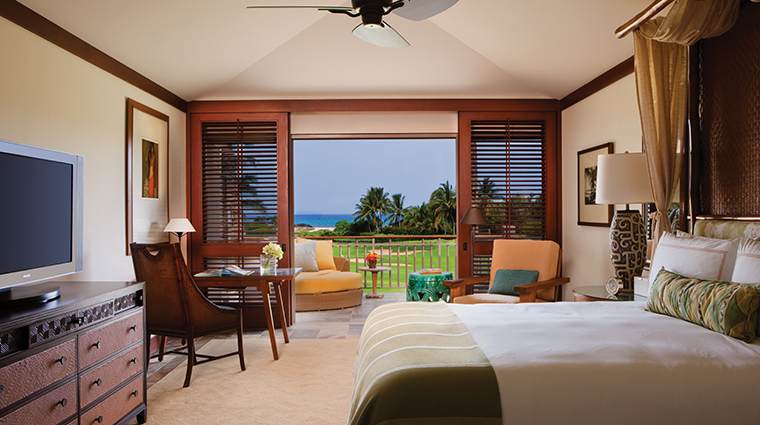 Rooms are spacious and comfortable, with large lanais for taking in the island air. The large array of kid-friendly activities, including the unique saltwater encounter pool where you can swim with eagle rays and tropical fish, makes the resort popular with families. 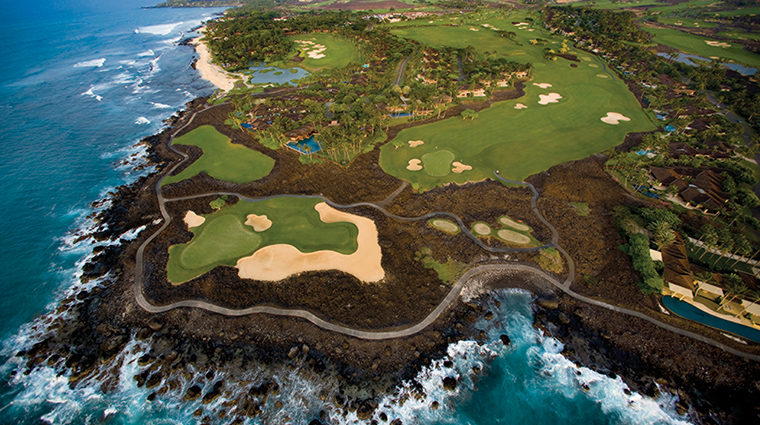 Those here for quiet time can retreat to the glamorous adults-only pool, or the Jack Nicklaus-designed golf course. 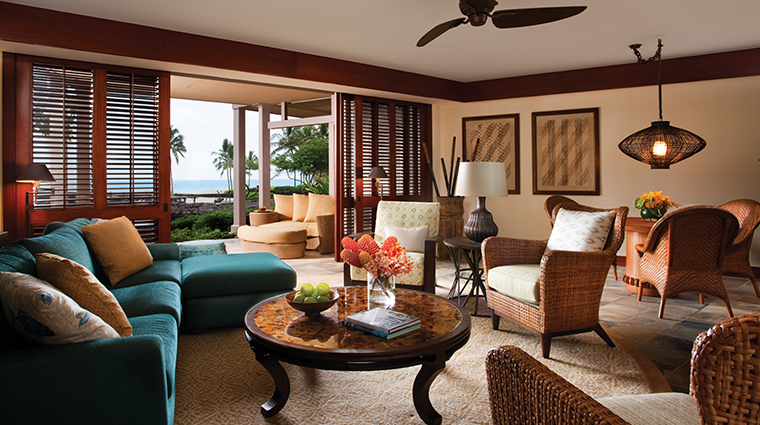 Situated on the secluded Kona-Kohala coast, Four Seasons Hualalai was designed to fit into its natural setting. 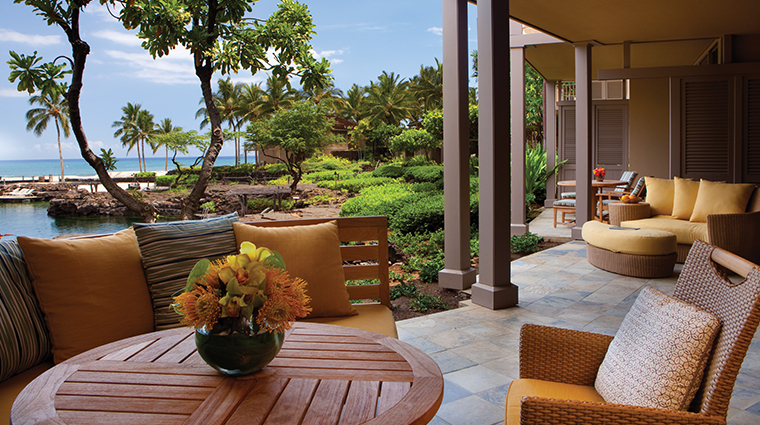 Luxurious bungalows are carved into the black volcanic rock landscape, allowing ocean views from all the rooms. The resort is centered around the beautiful Beach Tree Pool, both in style and in service. Pool attendants come by regularly with an endless stream of amenities: Evian spritzes, ice cream, sunglass cleaning service, and more. 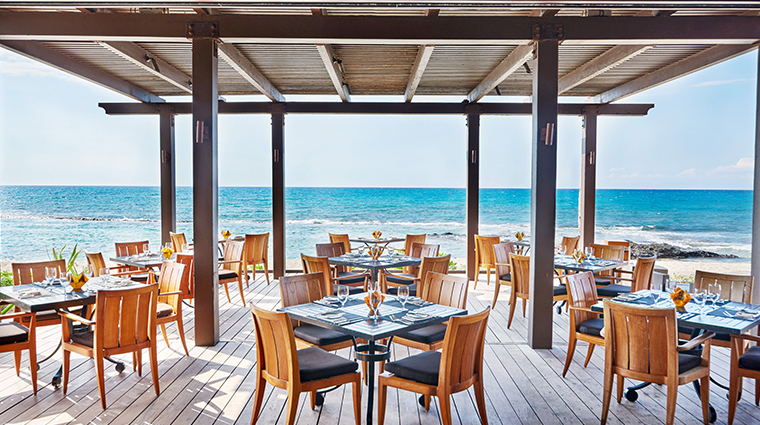 'ULU Ocean Grill and Sushi Lounge is one of the most romantic places to dine in Hawaii and the impeccable hospitality makes it even lovelier (the staff happily snaps photos in between serving courses). The 28,000-square-foot, Four-Star spa at this resort combines both open-air spaces with tranquil indoor settings to create an island-style sanctuary. 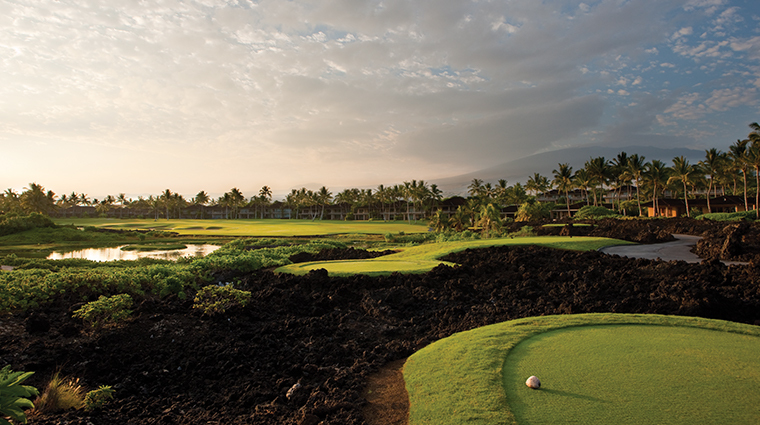 The Hulalalai Sports Club is easily one of the nicest and best outfitted facilities we’ve found, offering 15,000 square feet of health and fitness facilities, including a yoga studio, a tennis pavilion, a four-lane fitness pool, a rock-climbing wall, a sand volleyball court and a 1,300-square-foot state-of-the-art fitness center. The resort is divided into seven neighborhoods, with seven unique pools, including the adults-only Palm Grove Pool, the family-friendly Sea Shell Pool and the 1.8 million gallon King’s Pond, featuring more than 3,000 tropical fish. 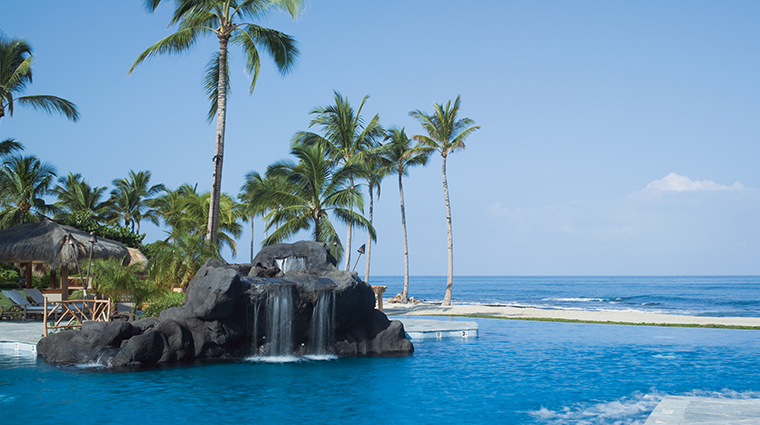 The Four-Star Hulalalai Spa features a unique offering: an apothecary where you can choose natural ingredients for a spa treatment. The Ka’upulehu Cultural Center offers unique opportunities to learn about the native Hawaiian culture, like star navigation, lauhala-weaving, shell crafts, feather art, ukulele lessons and Hawaiian language classes. The hotel is incredibly family-friendly, offering a complimentary Kids for All Seasons program that allows kids ages 5 to 12 to explore the resort’s rich tropical environment, with activities such as treasure hunts and volcano-building. Kids can even learn basic scuba skills in the resort’s swimming pool. The rooms, all in intimate two-story bungalows and facing the ocean, have private furnished lanais, slate floors and natural hardwood trim to complement the surrounding environment. 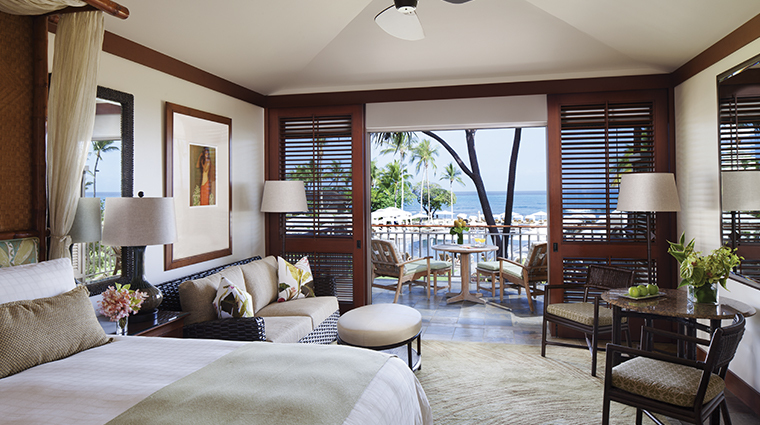 Unlike more modern boutique hotels that taut a more minimalist approach to the guest room décor, these rooms proudly feature Hawaiian artwork on the walls, giving guests a sense of place on the luxury resort's oceanfront property. Living areas are furnished with rattan chaise lounges, side tables, marble-top wooden dressers and entertainment centers with 42-inch flat-screen plasma TVs and DVD/CD players. The bedroom area features a custom bamboo canopy bed, walk-in closet and an iHome docking station that charges your mp3 device. Granite bathrooms have deep soaking tubs and separate glass-enclosed showers. 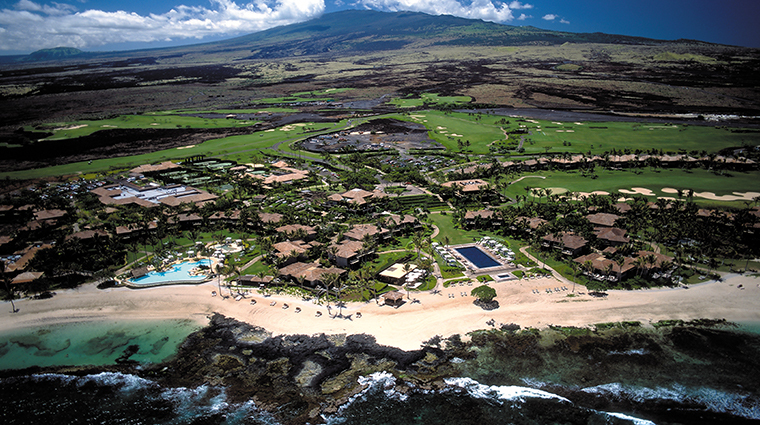 This Five-Star resort works with more than 160 local farms, with least a three-fourths of the dishes in all three of the property’s restaurants made from ingredients cultivated on the Big Island. 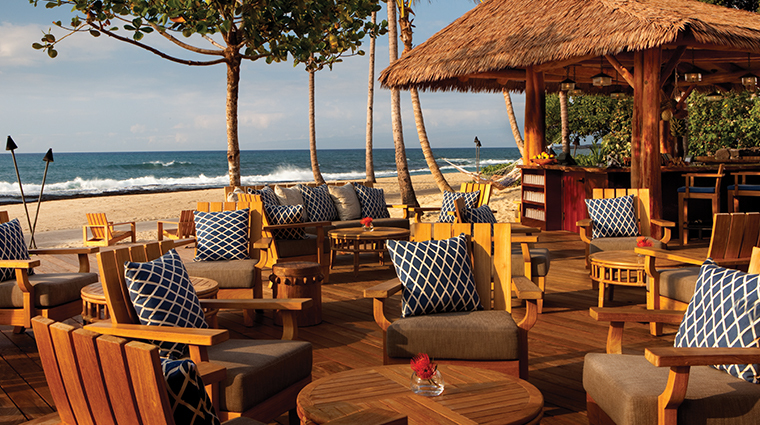 Beach Tree House offers California cuisine with strong Italian influences, featuring menu items like ahi carpaccio with citrus and avocado, a gorgonzola pizza topped with macadamia nuts and figs, gnocchi with an oxtail ragout and risotto with Hamakua mushrooms. 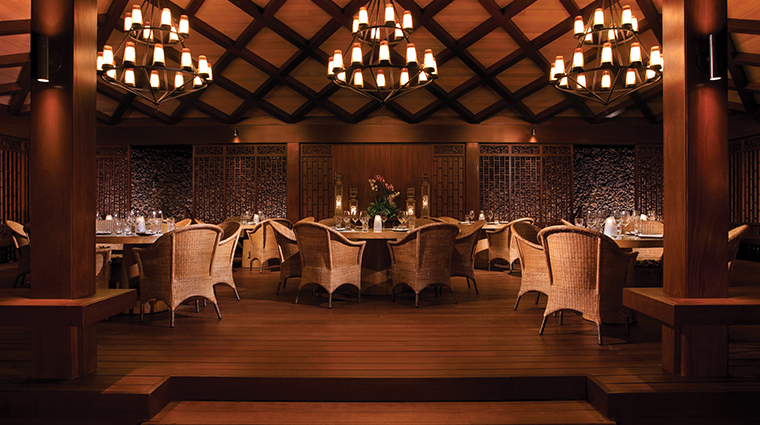 'ULU Ocean Grill and Sushi Lounge boasts a menu that features an impressive 75 percent of ingredients locally sourced. 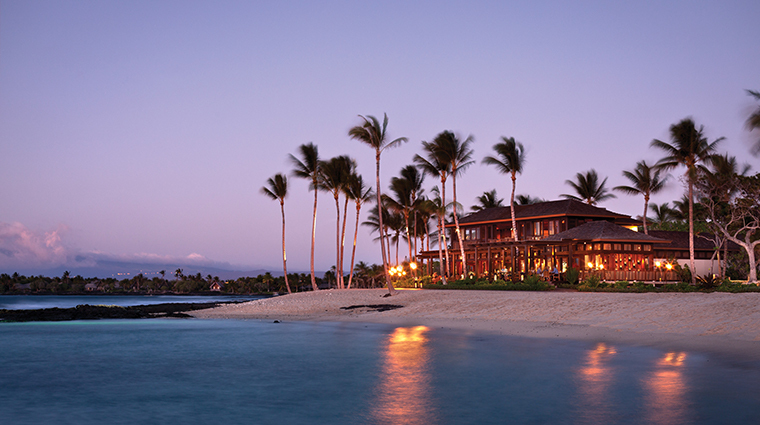 The ocean-to-table menu features items such as lobster wonton soup, Hawaiian ahi poke and oven-roasted Big Island wild boar. 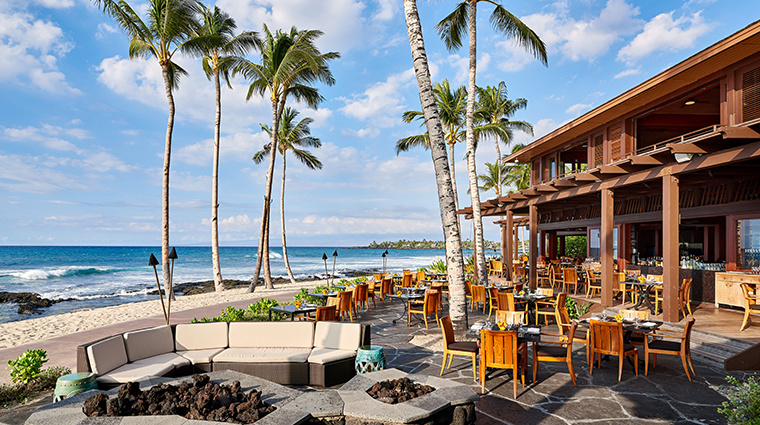 Hualalai Grille is the Hawaii resort’s casual dining restaurant, with an island-style gastro pub menu featuring a nice array of appetizers, salads, sandwiches and signature burgers — all using fresh, local ingredients. For quick bites and drinks, the coffee bar offers delicious Kona coffee, pastries and fresh fruit smoothies, while the general store is a charming throwback offering fresh salads, wonderful fresh baked bread, sandwiches and other items, as well as some excellent bottles of wine and cold local beers.